On this date in 1945 a special group met in the Pen­ta­gon to search for an alter­na­tive to dropping the atomic bomb on Japan. The group had been called into exis­tence by the new Ameri­can president, Harry S. Tru­man. Neither Tru­man nor any­one else in the room knew what kind of damage the still-un­tested wea­pon might do. What the planners thought they knew, how­ever, espe­cially as the fero­city of Jap­a­nese resis­tance on Oki­nawa became clear, was this: the tally of U.S. and Jap­a­nese war dead would boggle the mind. As it turned out, at the end of the Oki­nawa cam­paign (April 1 to June 21, 1945) the dead numbered 12,500 Amer­i­cans and 110,000 Japa­nese; the loss in tanks, ships (36 sunk and 368 damaged), air­craft, and other materiel was so se­vere three-quarters of the way through the cam­paign that poli­tical and mili­tary leaders alike were increas­ingly wary of the end­game costs. The in­va­sion of the Japa­nese main islands, or Home Islands, set to begin in November 1945 and end the next April, was esti­mated to cost as many as one mil­lion Allied lives, to say nothing of other losses on both sides. A short list of suit­able tar­gets was devised. Within two weeks Hiro­shima and Naga­saki lay in ruins, not to be the last if the coun­try didn’t surrender, Truman pro­mised Japa­nese leaders. The most de­struc­tive bomb in his­tory killed 120,000 people, brought World War II to an end, and marked the beginning of the atomic age. 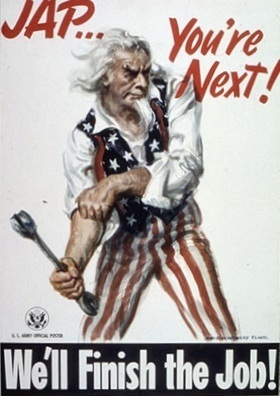 Left: U.S. Army poster prepares the Amer­i­can pub­lic for the in­va­sion of Japan after ending war with Ger­many and Italy. 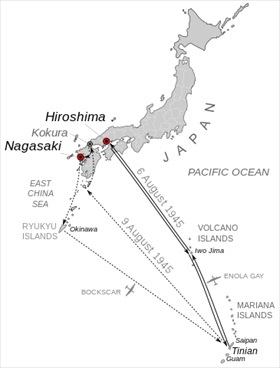 Right: Mission map for the atomic bombings of Hiro­shima and Naga­saki, August 6 (Enola Gay) and August 9, 1945 (Bocks­car). Koku­ra, on the north­ern tip of the south­ern Home Island of Kyū­shū, appears on this map because it was the origi­nal tar­get for August 9. Weather obscured visi­bility over Koku­ra, so Naga­saki, also on Kyū­shū, was chosen instead. 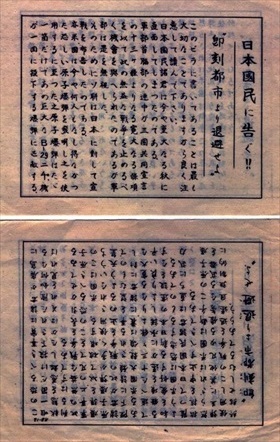 Left: Front and back of leaf­lets urging Japan’s quick sur­render were dropped over the coun­try by the 509th Com­po­site Group, a group that com­prised B‑29 bombers and trans­port air­craft. The 509th was a component of the U.S. Man­hat­tan Pro­ject under the com­mand of Lt. Col. Paul W. Tibbets, Jr. At 2:45 a.m. on August 6, 1945, the Enola Gay departed Tinian in the Mari­ana Islands for Hiro­shi­ma with Tibbets at the con­trols. Flight distance from Tinian to Hiro­shima was just under 1,600 miles, so it took the Enola Gay six hours to reach its desti­nation. The atomic bomb, code­named “Little Boy,” was dropped over the city at 8:15 local time. Tibbets reported that Hiro­shima was covered with a tall mushroom cloud after the bomb was dropped. 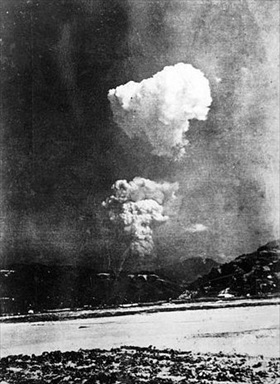 Right: Atomic cloud over Hiroshima, August 6, 1945, 8:45 a.m. This photo­graph was found in 2013 at Hon­kawa Ele­men­tary School (now a peace museum) and is believed to have been taken 6 miles east of ground zero about 30 minutes after detonation. Left: Hiroshima, September 1945. 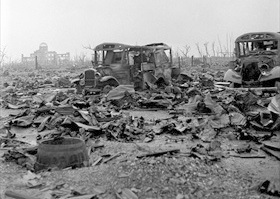 In the background the Genba­ku (A-Bomb) Dome, the only struc­ture left standing near ground zero. The building, at the time serving as the Hiro­shima Prefec­tural Indus­trial Pro­mo­tion Hall, later became a part of the Hiro­shima Peace Memo­rial Park, which was desig­nated a UNESCO World Heritage Site in 1996. 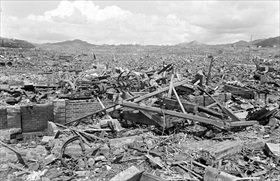 Right: Hiroshima, September 1945. Japa­nese off­icials deter­mined that 69 per­cent of Hiro­shima’s buildings were de­stroyed and another 6–7 per­cent were damaged. Out of some 70,000–80,000 peo­ple killed, 20,000 were sol­diers, a ratio of mili­tary to civil­ian dead Pre­si­dent Tru­man had urged (the higher the better) in his direc­tive to Secretary of War Henry L. Simpson.